The performance and survival of deciduous trees depends on their innate ability to anticipate seasonal change. A key event is the timely production of short photoperiod-induced terminal and axillary buds that are dormant and freezing-tolerant. Some observations suggest that low temperature contributes to terminal bud initiation and dormancy. This is puzzling because low temperatures in the chilling range universally release dormancy. It also raises the broader question if the projected climate instabilities, as well as the northward migration of trees, will affect winter preparations and survival of trees. To gauge the response capacity of trees, we exposed juvenile hybrid aspens to a 10-h short photoperiod in combination with different day/night temperature regimes: high (24/24 °C), moderate (18/18 °C), moderate-low (18/12 °C) and low (12/12 °C), and analysed bud development, dormancy establishment, and marker gene expression. We found that low temperature during the bud formation period (pre-dormancy) upregulated dormancy-release genes of the gibberellin (GA) pathway, including the key GA biosynthesis genes GA20oxidase and GA3oxidase, the GA-receptor gene GID1, as well as GA-inducible enzymes of the 1,3-β-glucanase family that degrade callose at plasmodesmal Dormancy Sphincter Complexes. Simultaneously, this pre-dormancy low temperature perturbed the expression of flowering pathway genes, including CO, FT, CENL1, AGL14, LFY and AP1. In brief, pre-dormancy low temperature compromised bud development, dormancy establishment, and potentially vernalization. On the other hand, a high pre-dormancy temperature prevented dormancy establishment and resulted in flushing. The results show that pre-dormancy low temperature represents a form of chilling that antagonizes dormancy establishment. Combined with available field data, this indicates that natural Populus ecotypes have evolved to avoid the adverse effects of high and low temperatures by initiating and completing dormant buds within an approximate temperature-window of 24-12 °C. Global warming and erratic temperature patterns outside this range can therefore endanger the successful propagation of deciduous perennials. Deciduous trees in temperate areas have a surprisingly short growing season. At northern latitudes, most of their lives are spent in a leafless state and exposed to low temperatures. Preparation for the winter requires multiple developmental adjustments, which are informed by the sequential decline in photoperiod and temperature. Photoperiod changes predictably during the Earth’s motion around the sun, and photoperiodic ecotypes exploit this regularity as an unambiguous measure of seasonal progression. The gradual shift in photoperiod and solar angle, and the corresponding change in radiation, drive the annual thermal cycle that determines the latitudinal and altitudinal distribution of plants . While photoperiod regulates the initiation and development of endo-dormant buds, hereafter referred to as dormant buds, subsequent exposure to low non-freezing temperatures releases dormancy and enhances freezing-tolerance . Currently, increased radiative forcing is raising the average global temperature, although the high northern latitude is projected to warm disproportionally , a phenomenon referred to as Arctic Amplification . As the shifting climate is outpacing tree migration [5–7], this will significantly affect both temperate and boreal forests, which harbour half of the world’s trees [8–10]. Many tree species are adapted to respond to critical short photoperiods, which are longer toward the North, resulting in shorter growing seasons at high latitudes . For example, Betula and Salix populations that are adapted to latitudes in the far North, initiate terminal buds (TBs) at a surprisingly long 22-h photoperiod, whereas southern ecotypes continue to grow until daylengths decrease to 15 h . For this reason, ecotypes do not prosper far outside their latitude. Changes in the annual thermal cycle are expected to challenge the adaptive mechanisms on which these ecotypes depend. As global warming tends to drive the geographic distribution of species towards the North, they could initiate winter preparations belatedly, according to the critical photoperiod of their origin, falling victim to arriving frost. On the other hand, at their current location, trees will not be able to profit from a longer growing season, due to their photoperiodic responsiveness, and might be outcompeted by invasive species. Moreover, it is unknown how the elevated temperatures will affect the seasonal cycle of perennials in general. Inherent to the global rise in temperature are climate instabilities [3, 4]. For example, in northern birch dormancy is released relatively early in autumn, well before winter arrives . Subsequent long warm spells in late autumn could trigger bud flushing and de-acclimation, rendering meristems vulnerable to frost [14, 15]. 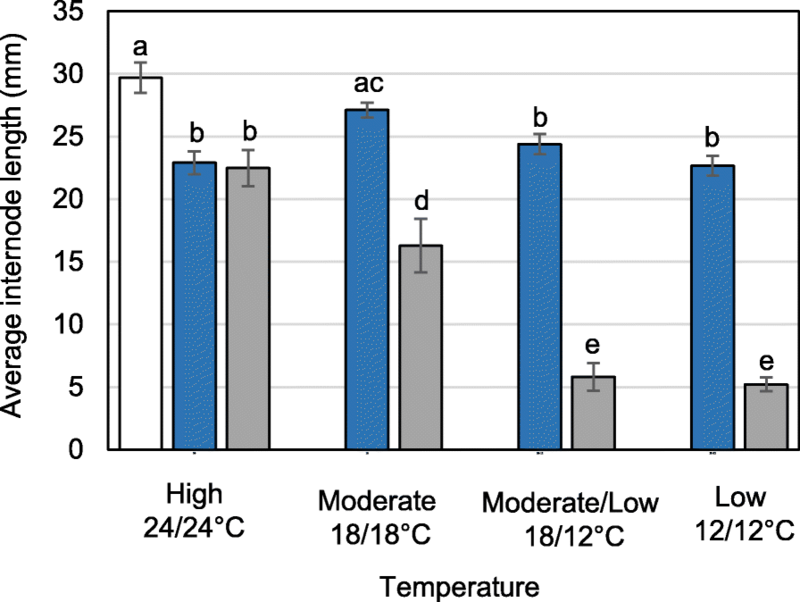 Controlled climate room experiments have demonstrated that photoperiod alone is sufficient to induce dormant buds at growth-promoting temperatures, and that subsequent chilling is required to release dormancy and enhance freezing tolerance [2, 13, 16, 17]. The role of temperature in dormancy establishment has remained controversial. Classic literature suggests that some trees, such as Populus, Malus and Acer, lose the capacity to form dormant TBs under low temperature conditions [18–21]. This would make successful north ward migration unlikely. Contrary to this, other studies propose that low temperature on its own could induce the establishment of dormant buds or contribute to it [22–27]. One reason for this ambiguity about the role of low temperature could be that bud formation is confused with dormancy. For example, in proleptic hybrid aspen, para-dormant and dormant axillary buds (AXBs) are structurally similar, but shoot decapitation can only activate para-dormant AXBs [28, 29]. TBs can also form temporarily under stress without establishing dormancy [12, 19, 30]. Even tropical trees show this behaviour during episodic growth, in response to drought, or during the alternation of elongation growth and branching [19, 31, 32]. Thus, conclusive assessment of whether buds are dormant, i.e. intrinsically arrested, requires tests in which buds are freed from apical dominance and correlative inhibition. Presently, tests should also include analyses of key marker genes of dormancy [28, 29, 33, 34]. The claim that low temperature in the chilling range can induce dormancy or contribute to its establishment is puzzling, because it is a universal cause of dormancy release [35–37], and there is no explanation of how low temperature could both induce and antagonize the same state. The manner in which temperature intersects with the photoperiodic pathway during bud initiation and dormancy therefore requires further investigation. The photoperiodic response that results in TB formation is well documented. For example, Betula and Populus monitor the declining photoperiod by means of light-sensitive phytochromes in the leaves [25, 38]. These pigments provide input to a circadian clock that transcriptionally regulates expression of the floral promoter CONSTANS (CO) and the key integrator gene FLOWERING LOCUS T (FT) . Populus possesses two functionally distinct paralogs, FT2 and FT1, which promote vegetative growth and flowering, respectively [34, 39, 40]. Exposure to short photoperiod downregulates FT2 in the leaves, and transiently upregulates the gene CENTRORADIALIS-like1 (CENL1) at the rib meristem to support TB formation [28, 34]. Thereby, the apex switches to the developmental program of AXBs, both structurally and molecularly. When TBs and the young AXBs complete their development and establish dormancy, CENL1 expression ceases. In contrast, para-dormant AXBs that develop under long photoperiod maintain a high level of CENL1 expression and are poised for vegetative growth, only requiring removal of apical dominance . During chilling-induced dormancy release, FT1 transcription is hyperinduced, but CENL1 is not . As these genes are central in the regulation of vernalization and floral transition [39, 41, 42], this suggests that low temperature not only releases dormancy, but may also promote vernalization of dormant buds. To clarify the role of temperature in dormancy establishment, it is important to assess how exposure to low temperature during the bud development phase (hereafter referred to as pre-dormancy) interferes with the transcriptional patterns of key dormancy-cycling and vernalization genes. At the morphogenetic level, TB development follows a predictable scenario. In the active shoot apical meristem (SAM) all cells participate in a gated symplasmic network that functionally and dynamically integrates cellular activities. We proposed a model in which the SAM is the organizer of primary development as well as the specific locus of dormancy [43–45]. We showed that under short photoperiod, callosic Dormancy Sphincter Complexes (DSC) close off plasmodesmata. These specialized DSC act as circuit breakers in the symplasmic circuitry of the SAM, blocking signal exchange as well as metabolic and electrical coupling, and dissipating supracellular surveillance and coordination [43, 46–48]. Subsequently, cellular activities diminish as membrane potentials drop, and metabolism and gene expression change as part of the acclimation process. Remarkably, this symplasmic shutdown is reversed by chilling-induced removal of DSC callose. As a result, the symplasmic network is restored, enabling renewed cell-cell communication once rising temperature gears up metabolism [16, 40]. The mechanisms by which photoperiod and chilling trigger the symplasmic alterations in the SAM have been investigated in detail in birch and hybrid aspen [16, 34, 40, 49]. Since a main constituent of the DSC is callose , the balance between 1,3-β-glucan synthases and 1,3-β-glucanases  is crucial in establishing and releasing dormancy [40, 41, 51]. The callose-hydrolysing 1,3-β-glucanases (family GH17) are diversified into an α-, β- and γ-clade [40, 52]. In hybrid aspen, the studied growth-related α-clade enzymes are downregulated, whereas γ-clade members are upregulated during bud formation as well as during chilling-induced dormancy release [29, 40]. Crucially, the growth-related α-clade members are inducible by GA4, while bud-related γ-clade members are responsive to GA3. The γ-clade enzymes localize at lipid bodies that accumulate in developing buds, and are displaced by chilling to plasmodesmata where they can remove callose [40, 43]. As this cellular mechanism is recruited by chilling, this raises the question if low temperature in the pre-dormancy phase could do the same, thereby counteracting installation of DSC and antagonizing establishment of dormancy. The role of low temperature in dormancy cycling is often discussed in terms of its signal value. However, both photosynthesis and phloem transport are sensitive to low temperatures [1, 53], which are likely to diminish the development of growing buds. Therefore, producing TBs before temperatures drop seems a superior strategy, as it allows diversion of photosynthates from growing points to buds and other reserve stores well before cold halts photosynthesis, induces leaf abscission, and renders sieve tubes in the shoot dysfunctional [54, 55]. The question if temperature influences the photoperiodic response that results in bud dormancy has a certain urgency in the context of climate change and the inherently unstable weather patterns. Decoupling of photo- and thermoperiod might present trees with conflicting environmental information, which could putatively diminish tree performance and survival in the long term. It is conceivable that unseasonal low and high temperatures could adversely affect the establishment of dormant buds. To address these possibilities, we exposed juvenile hybrid aspens (Populus tremula x P. tremuloides) to short photoperiod at four different day/night (D/N) temperature regimes: high (D/N 24/24 °C), moderate (D/N 18/18 °C), moderate-low (D/N 18/12 °C), and low (D/N 12/12 °C). We investigated TB initiation, AXB development, and bud dormancy establishment as well as the expression of marker genes. A main finding is that even mildly low temperatures (12 °C) during the bud-formation phase adversely affect the scheduling of the distinct phases of the dormancy cycle. Importantly, it diminishes bud-quality, prematurely triggers genes of the dormancy-release mechanism, and perturbs transcription of key vernalization pathway genes. Furthermore, at a high temperature (24 °C), the developing TBs flush regularly, and fail to establish dormancy. Our analyses of the critical photoperiod of given ecotypes in combination with local weather data support the hypothesis that natural Populus ecotypes have evolved to produce viable dormant TBs and AXBs within an approximate 24-12 °C temperature window, before temperatures reach chilling levels. Shoot elongation under long photoperiod involves a number of apical internodes that elongate simultaneously, albeit at different rates . Subsequent exposure to short photoperiod halts the production of new internodes, and eventually shoot elongation. To investigate if and how temperature influences this process, we monitored the response of two categories of internodes: (1) internodes elongating already under long photoperiod, and (2) internodes that were still in their incipient phase, including those that arose during the treatment. Internodes of the first category (long photoperiod, 18 h; 18/18 °C) slightly reduced elongation under subsequent short photoperiod relative to those that remained under long photoperiod (Fig. 1). Although the reduction was not statistically significant, it could reflect the shortening of the period plants could photosynthesize. A statistically significant reduction of approx. 17% (Fig. 1) was measured after lowering the night-temperature (18/12 °C), reflecting reduced night-time phloem transport from source leaves to internode sinks. Lowering also the day-temperature reduced elongation further to 24% (Fig. 1), possibly by diminishing photosynthesis. In brief, short photoperiod reduced elongation of stretching internodes quantitatively, in a temperature-dependent manner. The incipient and newly formed internodes showed a similar but much stronger trend. At constant standard temperature (18/18 °C), elongation of the top three internodes diminished by approx. 40% relative to the internodes below it (Fig. 1). When only the night-temperature was lower (18/12 °C) the reduction exceeded 70% (Fig. 1). Lowering also the day-temperature (12/12 °C) reduced elongation slightly further (78%, Fig. 1). In brief, short photoperiod alone affected mostly the incipient and new internodes. Low temperature during the night amplified this effect, whereas continuing low temperature through the day hardly reduced elongation further, reflecting reduced photosynthesis and night-time transport of photosynthates to incipient internodes. Low temperature also significantly increased the plastochron. During night-time it slightly reduced internode production, while continuous low temperature halved it (Fig. 2a). Similarly, overall gain in height was halved by continuous low temperature (Fig. 2b). The 24/24 °C temperature regime induced unique effects. In contrast to the other temperature treatments, internode stretching was the same in the two different internode categories. Notably, the incipient internodes lacked the enhanced responsiveness to short photoperiod, measured in the other temperature regimes (Fig. 1). In addition, the internodes that were already elongating remained significantly shorter at this high temperature, relative to similar internodes at moderate temperature (Fig. 1). Under high temperature the production and elongation of new internodes was prioritized, as the plastochron dramatically decreased, tripling the number of elongating internodes and leaves at week 4 (Fig. 2a). We next investigated if low temperature advances short photoperiod-induced TB initiation, as proposed in the literature. The first morphologically visible sign of bud formation is the metamorphosis of leaf primordia into scales. During leaf development, a primordium produces a lamina as well as stipules, thread-like appendages that decorate the leaf-base. Under short photoperiod, the apex reverses its developmental priorities, blocking lamina and leaf development while enlarging and hardening the stipules into bud scales. Because the last emerging long photoperiod leaves wrap the apex, visually concealing scale formation, we used a validated method to reconstruct the timing of scale initiation . For each of the selected photoperiod-temperature regimes, we counted the number of internode-leaf units that emerged up to the point where the SAM had initiated scale production. This internode-leaf unit count is analogous to the method used to determine flowering time in Arabidopsis. This showed that relative to 18/18 °C, the plastochron was shortened at 24/24 °C and lengthened at 12/12 °C (Fig. 2a). At constant 12 °C, the overall production of primordia slowed down substantially. Consequently, the first scales arose from developmentally older primordia that had formed under long photoperiod (Additional file 1: Table S1). If left at 18/18 °C, these primordia would have developed into leaves. Indeed, these developmentally older scales often had a rudimentary lamina (Fig. 3a, b). Under moderate temperature (18/18 °C), such lamina between the scales was not observed. In brief, low temperature affected TB composition by producing bud scales from older leaf primordia (Additional file 1: Table S1). At low temperature (12/12 °C) the plastochron was lengthened (Fig. 2), resulting in a general slow-down of primordium initiation at the apex, and a reduction of the number of primordia that gave rise to embryonic leaves inside the emerging bud. TBs that developed under standard conditions (18/18 °C) possessed 10 embryonic leaves on average, while TBs that were exposed to the mildly low temperature typically possessed 7 embryonic leaves. Interestingly, it did not make a difference if low temperature was applied continuously (12/12 °C) or only during the night (18/12 °C), suggesting that also here night-time import via the phloem is a limiting factor. Young AXBs, below the apex, responded in a similar fashion, as the number of embryonic leaves was reduced from 10 to 8 at both temperature regimes. As a result, TBs that formed at low temperature (either 18/12 °C or 12/12 °C), as well as AXBs that continued development at this temperature, were much smaller than those produced at moderate temperature (18/18 °C). TBs were clearly longer and broader at 18/18 °C than at the other temperature regimes. To a lesser degree, this was also true for AXBs (Fig. 4). As low temperature adversely affected bud ontogeny and structure, we next investigated if it also affected their capacity to establish dormancy. We applied low temperature only at night (18/12 °C), or continuously (12/12 °C). Although less effective than 5 °C, we chose 12 °C because it is permissive of growth and development, while still being in the 5-12 °C range for chilling and vernalization. At the moderate reference temperature (18/18 °C), it took four weeks to produce TBs, and after five weeks 100% of TBs and almost all AXBs (AXB positions 1–10) established dormancy (Fig. 5). Most AXBs at lower positions (11–30) had completed their development and were para-dormant prior to the transfer to short photoperiod. We found that low temperature during bud development significantly reduced dormancy establishment in both TB and AXBs (Fig. 5). The young AXBs were more resistant to the dormancy-releasing effect of low temperature than the TBs, reflecting that TBs were activated earlier than young AXBs. When only the night temperature was low, about 20% of TBs failed to establish dormancy, while this increased to approx. 60% when the temperature was continuously low (Fig. 5). 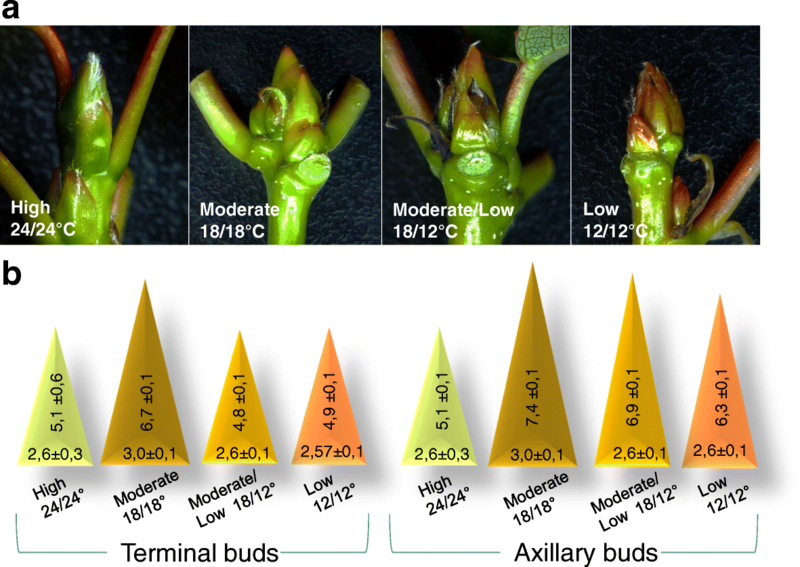 In young AXBs (positions 1–10), 12 °C at night-time alone hardly affected dormancy, but at continuous low temperature bud burst increased to 35% (Fig. 5). 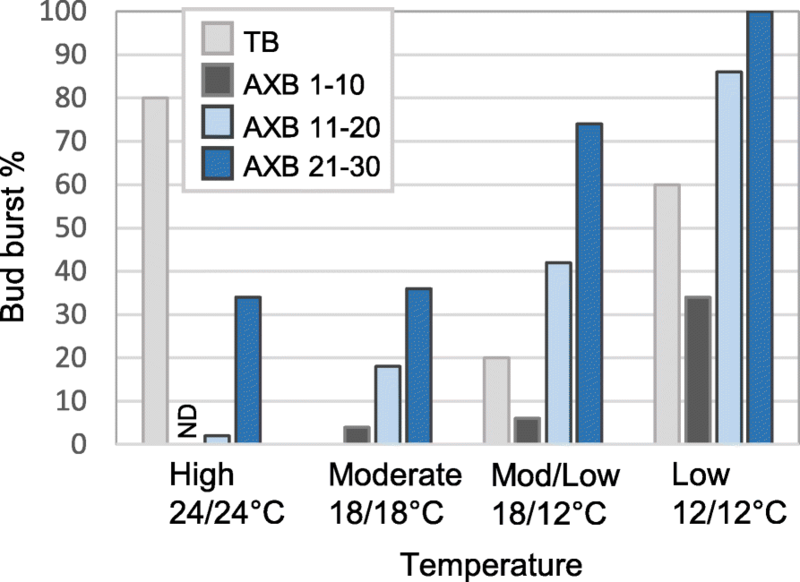 Older AXBs were highly responsive to 12 °C, and about 40% (11–20) and 75% (21–30) burst after night-time low temperature, and about 85% and 100% after continuous low temperature exposure, respectively (Fig. 5). The results clearly show that in combination with short photoperiod even mild chilling dampens dormancy establishment, demonstrating that in this species low temperature (12 °C) does not contribute to dormancy, but instead antagonizes it. Interestingly, while low temperature dampens dormancy, continuous high temperature (24/24 °C) prevented dormancy establishment in TBs, as most of them flushed (80%) after 3 to 4 weeks under short photoperiod. Surprisingly, new TB were produced, but part of them flushed again (ca. 40%). Young AXBs, flushed simultaneously with the TBs, and produced branches. To assess why short photoperiod failed to induce dormancy under low temperature in a large portion of TB (60%) and young AXBs (35%) (Fig. 5), we analysed the expression of genes that are known to function in chilling-induced dormancy release . We hypothesized that the antagonizing effect of low temperature was due to a prematurely triggered, mistimed chilling response that engages part of the molecular machinery that releases dormancy. To test this, we investigated gene expression in young developing AXBs, which were exposed to short photoperiod at different temperatures. We analysed the expression of genes involved in the production of biologically active GAs and GA signalling, as well as GA deactivation. In addition, we analysed the expression of four 1,3-β-glucanase genes (GH17), encoding representative members of the GA4-responsive α- and GA3-responsive γ-clades. Our data show that GA20ox8 and GA3ox1, key members of the GA20ox and GA3ox families, which are involved in the two final steps in the production of bioactive GAs , were considerably upregulated in AXBs that developed under low temperature (Fig. 6a). Similarly, GID1, which encodes a GA-receptor, was upregulated by low temperature in a dose-dependent manner (Fig. 6a). GA2ox1, encoding a GA-deactivating enzyme, was also upregulated by low temperature (Fig. 6a). We previously demonstrated that during chilling-induced dormancy release various members of the 1,3-β-glucanase enzyme-family localize to plasmodesmata where they hydrolyse callose at DSC, thereby potentiating cell-cell metabolic coupling, transport and communication . The present data show that the GA3-inducible γ-clade 1,3-β-glucanase genes, GH17_44 and GH17_101, were considerably upregulated under continuous low temperature (Fig. 6b). In contrast, the structurally different α-clade 1,3-β-glucanase genes, GH17_33 and GH17_102, which possess a GPI-anchor for localization to the outer leaflet of the plasma membrane, remained relatively unaffected by the low temperature (Fig. 6b). In brief, all the studied genes involved in GA-biosynthesis and GA-signalling, as well as those encoding 1,3-β-glucanases, showed an expression pattern during pre-dormancy low temperature treatment that resembled their expression during chilling-induced dormancy release at 5 °C  (Additional file 1: Figure S1). The finding that pre-dormancy low temperature hampered bud ontogeny and dormancy establishment suggests that it might also affect gene expression related to vernalization, even though these young poplars are not yet competent to flower. Notably, some of these genes, including CO, CENL1, and FT, play a role in both dormancy cycling and floral transition. To assess this, we analysed the expression of these three key floral pathway genes. The present data show that pre-dormancy low temperature significantly reduced CO expression in a dose dependent manner (Fig. 6c). Continuous low temperature prevented the downregulation of CENL1 (Fig. 6c), although during short-photoperiod induced dormancy establishment it is typically downregulated in TBs and AXBs. FT1 expression was virtually absent from dormant TB and AXBs, but it was hyperinduced after six weeks of chilling (5 °C), whereas the pre-dormancy low temperature upregulated it relatively little (Fig. 7a, c). We hypothesized that other floral pathway genes downstream of CO/FT could also be differently affected by pre-dormancy low temperature. Therefore, we investigated three key floral pathway genes that are related to vernalization, including putative poplar homologs of the SOC1-clade gene AGAMOUS-LIKE 14 (AGL14), APETALA1 (AP1), and LEAFY (LFY). Expression of AGL14 was lowest in dormant buds, but increased within three weeks in both TBs and AXBs after chilling at 5 °C (Fig. 7a). In contrast, pre-dormancy low temperatures reduced AGL14 expression in comparable AXBs to about half in the same period (Fig. 7c). AP1 expression during chilling of dormant buds was reduced, particularly in the TBs (Fig. 7a). During pre-dormancy, low temperature also significantly reduced AP1 expression in AXBs (Fig. 7c). Considering that AGL14 induces LFY, it was not unexpected that the pattern of LFY expression was similar to that of AGL14 in chilled dormant buds (Fig. 7a). Levels of LFY transcripts were highest at week six, at which point dormancy is released, in both TBs and AXBs (Fig. 7a). In stark contrast, pre-dormancy low temperature significantly reduced AGL14 and LFY expression, relative to the expression in chilled dormant buds (Fig. 7c). In conclusion, the upregulation of FT1, AGL14 and LFY by low temperature occurs only in dormant buds. Contrary to buds, FT1 transcripts in leaves were not at a measurable level regardless of the temperature regime. Surprisingly, the embryonic leaves that emerged from the buds after TB flushing at 24/24 °C expressed FT1 at steady, albeit relatively low levels (Additional file 1: Figure S2). Considering that xylem-fed GA4, but not GA3, induces bud flush even when buds are dormant , we investigated if these hormones could potentially mediate high temperature-induced bud flushing. This showed that GA4, but not GA3, promoted FT1 expression in para-dormant buds (Fig. 8a). In contrast, while GA3 promoted CENL1 expression in all bud types and states, GA4 did not promote it in para-dormant buds (Fig. 8b). The bud burst test showed that not all buds were able to burst after pre-dormancy low temperature treatment. Gene expression analyses showed that the genes that are involved in bud suppression were upregulated, possibly contributing to diminished bud break. Suppression of AXB burst in hybrid aspen involves MORE AXILLARY BRANCHES (MAX1), a strigolactone biosynthesis gene, and BRANCHED1 (BRC1), encoding a transcription factor that functions downstream of MAX1. As shown here, six weeks of chilling and pre-dormancy low temperature upregulated MAX1 two to three-fold (Fig. 7b, d). In contrast, BRC1 expression was reduced after six weeks in chilled dormant buds, whereas pre-dormancy low temperature upregulated the gene (Fig. 7b, d). In conclusion, the expression of these branch-inhibitor genes could counteract the dormancy-releasing effect of pre-dormancy low temperature, thereby preventing flushing. To investigate if our finding that pre-dormancy low temperature antagonizes dormancy establishment (Figs. 5 and 6) is in agreement with the situation in the natural environment, we analysed data of European aspen, a close relative of hybrid aspen. Populations indigenous to latitudes 63o, 59o, 56o and 51o have a critical photoperiod of 21 h, 19 h, 17 h and 15 h, respectively . We compared the length of the local photoperiod with the average monthly as well as daily minimum and maximum temperatures at the given coordinates. The publicly available data (https://www.timeanddate.com) show that the critical photoperiod (day length) for the two northernmost ecotypes is at the June solstice, whereas for the two southernmost ecotypes, the critical photoperiods are perceived in mid-July and early August, respectively (Additional file 1: Figure S3). As the development of complete TBs takes about four weeks , bud formation in all ecotypes appears to be completed before temperatures reach sustained low levels. The perennial growth habit of deciduous trees owes its success to a strategy that maximizes the growing period, while leaving sufficient time to prepare for winter. This proactive program implements a sequence of events that culminates in the establishment of dormant acclimated buds. Historically, dormancy is an umbrella concept that covers multiple inactive states, attributed to whole plants, organs, or any meristem-containing structure [19, 57]. Two decades ago, a new paradigm was proposed, identifying dormancy as an intrinsically arrested state, the locus of which is the SAM [44, 45]. This anchors the concept of dormancy to the SAM as a self-organizing and autopoietic unit that drives primary morphogenesis, and self-arrests in response to short photoperiod signalling [44–48]. Escape from self-arrest requires chilling [16, 58]. The orderly progression of the dormancy cycle, guided by a sequentially declining photo- and thermoperiod, might be perturbed by the thermal instabilities that accompany global warming. The present experiments demonstrate that pre-dormancy low temperature provides chilling to the buds, because it triggers the dormancy release mechanism, validating the concept of pre-dormancy chilling. Despite the fact that global temperatures have been rising, and heat waves have become more frequent and long lasting during the past decades [59, 60], the effect of temperature on dormancy cycling in perennials has not received the attention it deserves. Although warming is often viewed as positive, potentially lengthening the growing period and yield, it can also have negative effects due to the interaction with other environmental parameters. The present study confirms this scenario. Although high temperature significantly increased growth, in combination with short photoperiod it led to a reduced capacity to establish dormancy. Due to warming, trees will initiate TBs at increasingly higher temperatures at their current locations, potentially compromising dormancy. In a previous study on Populus, dormancy establishment at 25 °C was strongly delayed . In the current experiments most buds failed to establish dormancy, and buds flushed, even repeatedly (Fig. 3d). Although high temperatures compromise the capacity to establish dormancy, flushing can be a sign of adaptive plasticity. For example, it may enable utilization of the full growing season in situations where very early bud burst leads to pre-mature dormancy before the June solstice . A surprising finding was that FT1 was involved in high temperature-induced (24 °C) bud flushing (Additional file 1: Figure S2). As GA4 induces bud burst , and is required for elongation growth, it is tempting to speculate that a network including FT1 and GA-regulated 1,3-β-glucanases drives high-temperature induced premature bud flushing. 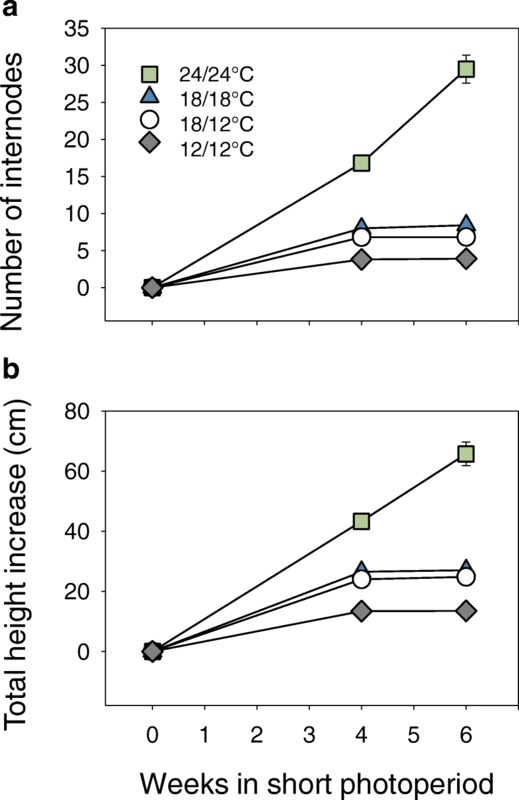 Meristem transitions triggered by temperature elevation could be more general, as in Arabidopsis a moderate increase from 23 °C to 27 °C upregulated FT and induced flowering under short photoperiod . Pre-dormancy chilling did not advance TB formation in our experiments, contrary to many literature suggestions [22–27]. These studies relied predominantly on visual observations. Indeed, TBs can become visible earlier, but we conclude based on bud ontogeny and scale development [64, 65] that TB visibility is not an adequate criterion for the timing of bud initiation. The reason is that low temperature slows down the production of primordia at the apex, possibly exposing older primordia to scale-inducing signals, and belatedly converting them to scales equipped with a rudimentary lamina (Fig. 3). Consequently, fewer leaves below the bud need to unfold, thereby revealing the completed TB earlier. Indeed, an earlier phenological study reported that low temperature does not affect the timing of bud set in the Swedish aspen collection . Our data are in agreement with this, but show in addition that low temperature in the chilling range negatively affects bud ontogeny and development. That pre-dormancy chilling increased the plastochron, reducing the number of embryonic leaves and bud size (Fig. 4), is disadvantageous because the embryonic shoot is a ‘lifeline through winter’, bridging the gap between seasons . Surprisingly, this quality aspect of bud development has not received much attention, although it affects tree performance and survival. A reduced number of embryonic leaves might influence how well the bud can support production of neoformed leaves in the next season. In adult trees, which have many determinate shoots, and which do not produce neoformed leaves [67, 68], the quality of buds is even more important. In addition, it could also negatively affect floral competence, as reproductive meristems are formed in the axils of late pre-formed leaves in the AXBs [39, 42]. An important focus of the current work was to assess if low temperature affects dormancy establishment. During dormancy, callose containing DSC at all plasmodesmata lock the SAM in a dormant ‘offline’ state, in which the cell-cell communication that drives morphogenesis is abolished [46, 49] (Fig. 9). The molecular mechanism of chilling-induced dormancy release restores the symplasmic communication network involving plasmodesmata-associated 1,3-β-glucanases, which hydrolyse callose at the plasmodesmal DSCs , creating a ‘standby’ state that is inactive and eco-dormant. Developing AXBs and TBs can become dormant under short photoperiod, probably because as active sinks they are accessible to long-distance photoperiodic signals [28, 29]. Although lower temperatures than the one used here during pre-dormancy chilling (12 °C) are more effective in providing chilling [69, 70], our findings show that this temperature reduced dormancy in a dose-dependent manner (Fig. 5). Despite being at the border of the chilling range [35–37], this temperature had a cumulative effect like chilling-induced dormancy release at 5 °C . Importantly, our molecular analyses indicated that it also utilized the same mechanism as in chilling-induced dormancy release . Our results do not exclude that low temperature and other stresses, like drought, can induce growth cessation and even bud formation [12, 19, 30], but based on the present work these buds are likely to be eco-dormant. Pre-dormancy chilling specifically and significantly upregulated the GA3-regulated γ-clade 1,3-β-glucanases, like in chilled dormant buds, while growth-related GA4-regulated α-clade 1,3-β-glucanases were hardly affected (Fig. 6b). This strongly suggests that under short photoperiod low temperature triggers this mechanism by default. As during chilling-induced dormancy release these GA3-regulated γ-clade 1,3-β-glucanases are delivered by lipid bodies to plasmodesmata , it seems likely that pre-dormancy chilling induces the same process prematurely. The enhanced expression of the GA3-regulated 1,3-β-glucanases during pre-dormancy chilling is congruent with the simultaneous upregulation of the GA-biosynthesis and signalling genes (Fig. 6a). That GA-catabolism was also enhanced (Fig. 6a), like in dormancy release , could indicate that GA2ox1 functions to deactivate growth-related GA4. The present findings suggest the possibility that pre-dormancy chilling triggers the premature involvement of the 13-hydroxylation pathway of GA biosynthesis, increasing the level of GA3. 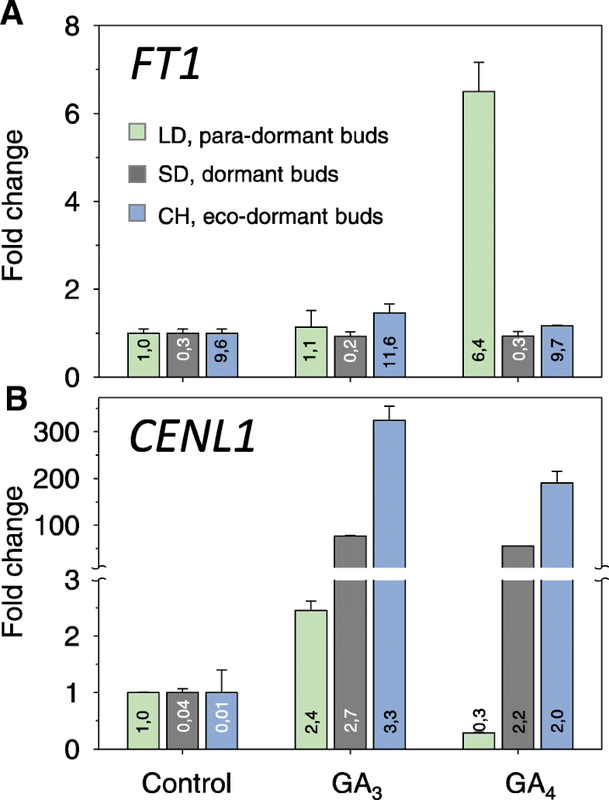 That during pre-dormancy chilling buds failed to downregulate CENL1 (Fig. 6a), which is characteristic of the dormant state , could be due to the elevated GA3 levels. Indeed, GA-feeding experiments showed that particularly GA3 strongly upregulated CENL1 in dormant, para-dormant and released buds, while FT1 was only upregulated by GA4 in para-dormant buds (Fig. 8). This contrasting induction of CENL1 and FT1 with different GAs suggests differential gene regulation and epigenetic states. The distinct nature of GA3- and GA4-induced effects on bud burst and gene expression is striking, and warrants further investigation. Despite the activation of GA-biosynthesis, buds remain suppressed at low temperature, indicating that antagonistic factors are operational. A prominent inhibitor of bud activation is strigolactone . Strigolactone biosynthesis gene MAX1 and the strigolactone signalling gene MAX2 are upregulated during AXB development, together with the downstream targets BRC1 and BRC2, indicating that they collectively contribute to the suppression of buds in different Populus species [28, 72]. The current data show that pre-dormancy chilling further upregulates these inhibitory pathways (Fig. 7d). The strigolactone pathway is thus not only involved in suppressing burst of para-dormant AXBs, but also in repressing AXBs that are released from dormancy (Fig. 7b, d). That low temperature intersects with the strigolactone pathway might be more general, as it is also found in Arabidopsis and pea . There is an interesting parallel between vernalization and chilling-induced dormancy release. Both processes require similar low non-freezing temperatures over an extended period, and both processes are quantitative in nature [35–37]. Not surprisingly, it has remained a long-standing question if they involve overlapping processes [27, 36, 42, 43, 51, 74, 75]. During vernalization, floral suppressors diminish over time, allowing floral transition when the temperature rises in spring. For example, in Arabidopsis, a 6–12 week exposure to 4 °C epigenetically reduces the transcript level of the floral suppressor FLOWERING LOCUS C (FLC) in vascular tissue and the SAM, activating the genes FT and SOC1 in leaves, and SOC1 in the SAM [76–80]. Subsequently, the floral integrator SOC1 and the mobile protein FT activate the floral identity genes LFY and AP1 in the SAM, which can amplify each other’s expression [76, 81]. Although poplars do not have close homologues to Arabidopsis FLC, they do have FLC-like genes [82, 83]. It seems likely that also in poplar chilling removes an inhibitory module, as 5 °C-chilling of dormant buds hyperinduces FT1. This could involve CO, which encodes a B-box protein that binds to the FT promoter in a complex with AS1 . CO expression in dormant buds of hybrid aspen increases during chilling, but in contrast, pre-dormancy chilling significantly reduced it (Fig. 6). This is congruent with the fact that pre-dormancy chilling did not upregulate FT1 to the high level found during chilling of dormant buds (Fig. 7a, c). In adult poplar trees, FT1 upregulation and acquisition of floral competence promotes floral transition [39, 41, 42]. In Arabidopsis, the floral transition involves FT1, LFY as well as AGL14 . We used putative P. trichocarpa homologues of these genes as indicators of the floral transition. Surprisingly, we found that hyperinduction of FT1 during chilling of dormant buds was accompanied by a significant upregulation of the AGL14 and LFY homologues in both TBs and AXBs. In contrast, pre-dormancy chilling reduced the expression of AGL14 and in particular LFY (Fig. 7a, c). In Arabidopsis, AP1 is required for petal and sepal development , while in aspen it is also upregulated under short photoperiod in developing poplar buds , possibly serving scale formation. Although chilling downregulated AP1 expression in dormant buds as well as in chilled pre-dormant buds (Fig. 7a, c), in the latter case AP1 transcription remained repressed throughout bud development. In conclusion, chilling of dormant buds promotes the expression of key floral pathway genes, whereas pre-dormancy chilling hampers their transcription (Fig. 7a, c). The implication might be that low temperature in the bud formation phase reduces floral competence. Thus, vernalization-induced flowering might require a previous dormancy phase, the realization of which might help to identify determinants of vernalization. Despite the activation of floral pathway genes in chilled dormant buds, juvenile poplars do not transition to flowering, suggesting that inhibiting factors are present, including CENL1/TFL1. The balance of FT/TFL1 is believed to determine multiple aspects of growth and flowering . For example, in young Arabis alpina plants, TFL1 competes with FT1 for binding to FD in a complex with 14-3-3 protein, thereby preventing vernalization . Since in hybrid aspen, CENL1/TFL1 expression ceases during dormancy establishment, and remains unaltered during dormancy release by chilling , additional floral inhibitors must be present. Particularly so, as FT1 is upregulated in chilled dormant buds, and the FT1/CENL1 ratio should strongly favor flowering. These inhibitors could include BRC1, which in Arabidopsis interacts with FT to suppress FT-induced floral transition in AXBs . Given the relative closeness of the two species , it seems possible that in juvenile hybrid aspen the high level of BRC1 expression in AXBs developing under long photoperiod  and during pre-dormancy chilling under short photoperiod (Fig. 7d) can be involved in neutralizing FT1. 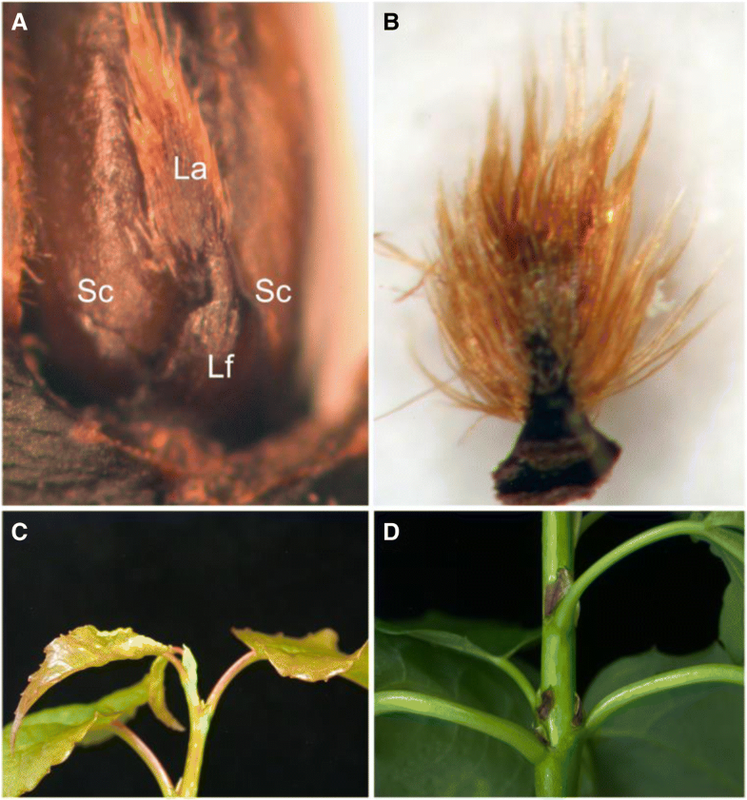 Remarkably, pre-dormancy chilling not only failed to upregulate FT1, AGL14 and LFY, it also enhanced expression of genes that repress bud burst or floral transition, including MAX1, BRC1 and CENL1. The present experiments, carried out in controlled conditions, demonstrate that bud formation and dormancy establishment benefit from moderate temperature conditions (around 18 °C). The decoupling of the photo- and thermoperiod during global warming might also have repercussions for trees in the field. For example, transplanted southern species are at risk of premature exposure to low temperatures, as they will initiate TBs at the critical photoperiod of their origin. In our controlled environment experiments, pre-dormancy chilling reduced bud quality, dormancy establishment and bud fate. High temperatures (24 °C) were equally disruptive, triggering bud flushing in the pre-dormancy phase. Although in nature, such day temperatures do occur during summer, they might be balanced by cooler nights . Our experimental results suggest that sustained warm periods, as projected by climate models, will interfere with dormancy establishment. The present finding that pre-dormancy chilling is an antagonizing force, is in agreement with the bud set data of closely related European aspen ecotypes (P. tremula)  (Additional file 1: Figure S3). The critical photoperiods of these provenances might have evolved under selection pressure to avoid low temperature exposure during bud development. However, it remains an interesting possibility that, with regard to temperature tolerance and sensitivity in dormancy cycling and vernalization, ecotypic variation might mitigate the effects of warming at high latitudes . There can be standing genetic variation also in the length of the critical photoperiod, providing adaptive potential for northward migration without gene flow, except in the most northern populations . In brief, locally adapted ecotypes secure proper bud development and dormancy establishment before temperatures decline to chilling levels. Thus, adverse temperature conditions, either too warm or too cold, may compromise dormancy establishment and reduce reproductive success. This is in agreement with early reports on Populus species that photoperiodic induction of dormancy is effective only in a restricted temperature range [18, 19]. Although in general, fitness is a trade-off between investment in survival and reproduction, timely investment in winter preparation may serve both. Our experimental results, obtained in controlled environment conditions, support the hypothesis that photoperiodic induction of dormancy is successful within a 24-12 °C temperature-window (Fig. 9). This might also be a valid approximation for the natural environment. Even though early bud set seems to unnecessarily shorten the growing season, it serves the overall optimization of winter preparations and growth in the next season. At growth-promoting temperatures and relatively long photoperiods photosynthetic capacity and phloem transport can be maintained at a high level, allowing proper bud development, the filling of reserve stores, as well as the acquisition of freezing-tolerance and floral competence. Pre-dormancy chilling as well as unseasonal warm periods can impede the scheduled winter preparations, thereby reducing survival and reproductive success. We conclude that the mechanisms that induce and release dormancy operate simultaneously and antagonistically when plants are exposed to low temperature under short photoperiod. Global warming and erratic temperature patterns may therefore interfere with seasonal cycling and compromise overall fitness of photoperiodic ecotypes. Hybrid aspen (Populus tremula x P. tremuloides) clone T89 was micropropagated in vitro, and planted in soil as described previously . T89, which has a critical short photoperiod of 16 h , was grown at a long 18 h photoperiod in a greenhouse at approx. 18 °C and 75% relative humidity (RH). Plants were watered twice a day, and natural light was supplemented to ca. 200 μmol m− 2 s− 1 at 400 to 700 PPFD nm (Osram). After six weeks, when elongation and leaf production rates were constant, the approx. 80 cm tall plants were subdivided into two groups. One group (n = 72 plants) was exposed to short photoperiod for six weeks to induce dormancy. During this treatment TBs and developing AXBs (para-dormant) become dormant. Subsequently, plants were exposed for six weeks to traditional chilling at 5 °C to release dormancy (eco-dormant). The other group of plants (n = 80) were subdivided into four equal groups, transferred to controlled climate cabinets, and acclimated for three days in long photoperiod. Subsequently, four different day/night temperature regimes were used: ‘high’ (D/N 24/24 °C), ‘moderate’ (D/N 18/18 °C), ‘moderate-low’ (D/N 18/12 °C), and ‘low’ (D/N 12/12 °C). At the start of the distinct temperature regimes, the daylength was reduced to 10 h in all cabinets. Although temperatures between 5 and 7 °C are optimal for chilling induced dormancy release in many species, we chose 12 °C for low-temperature exposure because it is the upper temperature threshold for chilling while still permitting growth [35–37]. We monitored plant growth by measuring overall shoot elongation as well as the number of new internodes that were produced at week four and six. After four weeks, we analysed bud structure in five plants per treatment. TBs and multiple AXBs were collected, fixed in 70% alcohol, and stored at 4 °C. Buds were examined, photographed and their sizes measured, using a preparation microscope. Each bud was opened with a surgical scalpel and the number of bud scales, embryonic leaves, and leaf primordia were counted. The presence or absence of a rudimentary lamina at the bud scales was recorded. We tested the effect of the different treatment regimens on dormancy establishment after six weeks by transferring TBs and bud-internode units to mild forcing conditions (16 h light, PPFD 170 μmol m− 2 s− 1, 18 °C, 70% RH). Stems were cut into internodes, with the AXB at the higher end of approx. 2 cm long segments. The stem bases were inserted through tiny holes in a supporting Styrofoam sheet, and floated on water or 100 μM solutions of GA4 or GA3, with the lower stem end submerged. Bud burst was scored as described previously . AXBs were grouped into three subsequent categories, reflecting developmental-, mature- and potentially senescent-stages: ‘young AXB’ (positions 1–10 from the top), ‘maturing AXB’ (positions 11–20 from the top) and ‘old AXB’ (positions 21–30 from the top). To compare the effect of post-dormancy chilling and pre-dormancy chilling on gene expression two experiments were performed. (1) Dormancy was induced by short photoperiod at 18 °C, and subsequently plants were exposed to chilling. (2) Dormancy was induced by short photoperiod at four different temperature regimes (conditions as above). We analysed TBs and young AXBs (positions 1–10), which are still sinks that are susceptible to short photoperiod signalling from the leaves, and can establish dormancy [28, 29]. For each data point, RNA was extracted from six plants, divided into two biological replicates. In all cases, sampling was carried out during the last hour of the short photoperiod. In addition, leaf tissue around major veins was collected from each group. Samples were frozen in liquid nitrogen and stored at − 80 °C for later RNA extraction and qPCR analysis. Frozen leaf tissues and buds were ground with a mortar in 750 μl extraction buffer and processed further as described previously . Quantitative reverse transcription-PCR (qRT-PCR) analyses were performed with the ABI Prism 7500 Fast sequence detection system, using SYBR Green PCR master mix (Applied Biosystems). Transcript levels were normalized with Populus actin. Gene-specific primer sequences are listed in Additional file 1: Table S2. Local photoperiod with the average temperature at the corresponding coordinates were retrieved from the publicly available website Time and Date (https://www.timeanddate.com). BLAST searches in GenBank and the P. trichocarpa genome v3.0  databases (http://www.ncbi.nlm.nih.gov/BLAST; http://www.phytozome.net) was used to identify genes, and ClustalW (http:// www.ebi.ac.uk/Tools/msa/clustalw2) to perform multiple sequence alignments. Gene- specific primer sequences for the qPCR analysis were designed with Primer3 (http://frodo.wi.mit.edu/primer3). The financial support of the Norwegian Research Council is gratefully acknowledged. We appreciate the excellent technical help by Linda Ripel and Marit Siira. We would like to thank the two anonymous reviewers for their constructive comments and suggestions. The research was supported by the Norwegian research Council to CvdS and PLHR (FRIBIO projects 192013 and 263117). The material and datasets generated and/or analysed during the current study are available from the corresponding author on reasonable request. PLHR and CvdS planned the experimental design. PLHR and LKP performed and analysed the data and interpreted the data together with CvdS. PLHR wrote the paper with significant input from all co-authors. All authors read and approved the final manuscript.